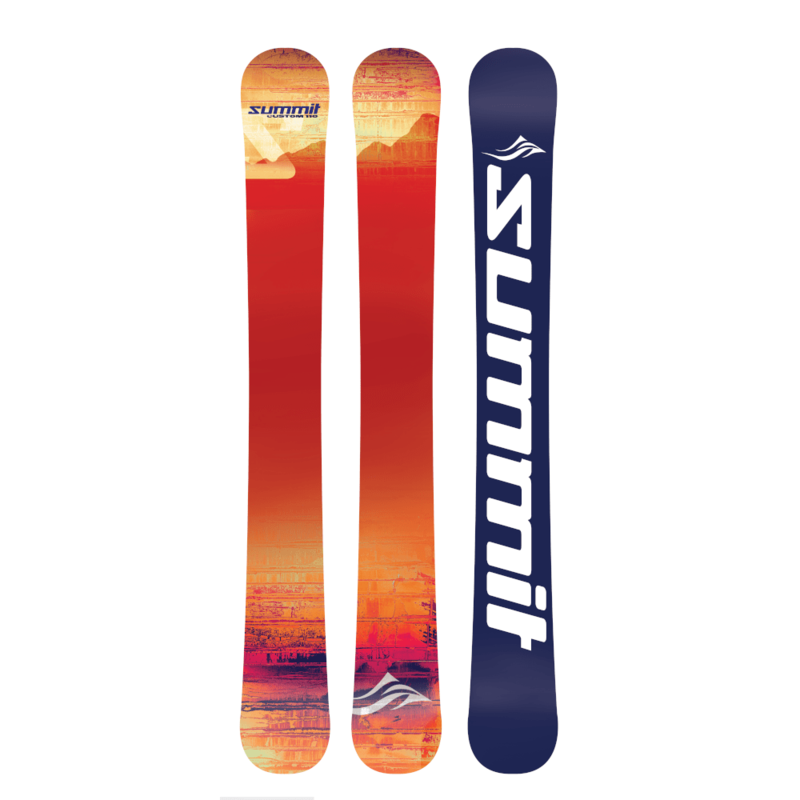 Summit Skiboards brings back the ever popular Summit Custom 110 cm 3D skiboards 2019. 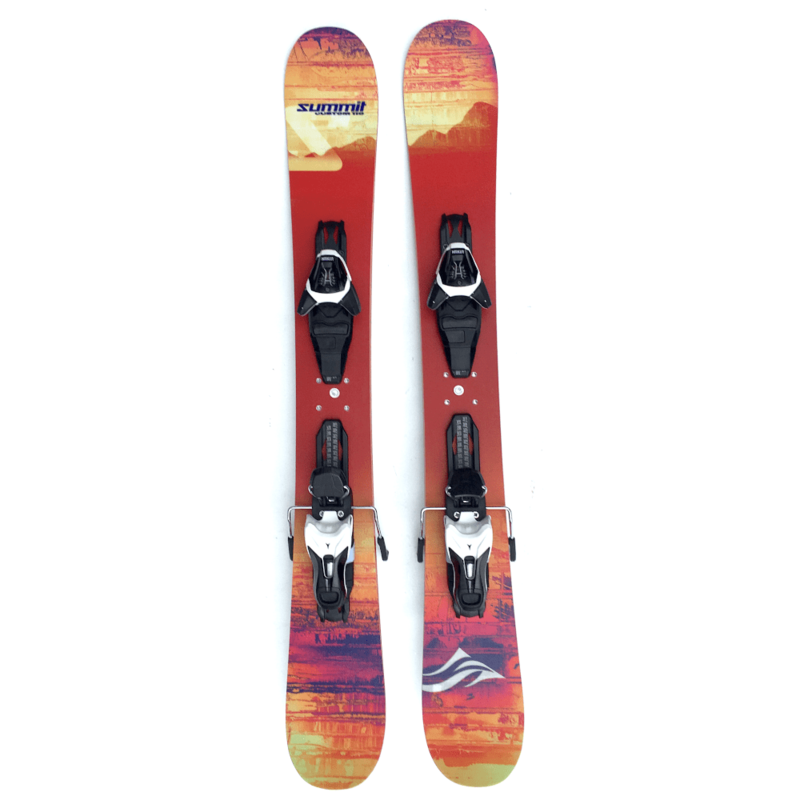 The Custom 110 delivers almost effortless carves, great everywhere on the mountain. Summit Skiboards brings back the ever popular Summit Custom 110 cm 3D Skiboards 2019. The Custom 110 delivers almost effortless carves, with stability at speeds that will truly surprise you. These high energy skiboards hold an edge, no matter how much you lay it over. The 3D model features a Carbonium top sheet, highly durable, yet allowing the beautiful graphics to show through without distortion. It’s our most durable top sheet. The 110 cm length is the perfect length for all mountain skiboarding, whether hitting those secret powder stashes, plunging down steep chutes or making super fast turns through the moguls and trees. The aggressive beveled edges and torsional stiffness provide amazing hold on hard pack and ice, delivering speed without chatter. In addition, a rubber dampening layer is included to absorb vibrations, while still allowing maximum road feel. As with all Summit Skiboards, these skiboards are handcrafted one pair at a time. Summit spares no expense in selecting just the right combination of quality materials for one goal – maximum performance and fun on the slopes. These Custom 110 cm skiboards feature a super high quality construction with a parabolic sidecut that functions impeccably with the solid Northern Hemisphere Birch/Poplar vertically laminated wood core. This is backed by a 2 year manufacturer warranty. Translated, Summits will ride like no other brand of skiboards. One unique thing about the Summit Custom 110 cm 3D Skiboards is that they accommodate a full range of binding options, including ski release bindings like the Atomic L10, backcountry Atomic and Salomon AT bindings, telemark bindings or even snowboard bindings — like the Technine Custom Pro DS Snowboard Bindings. A special aluminum layer (does not inhibit flex) is installed beneath the top sheet for maximum retention of mounted release bindings as well as providing enhanced edge grip. 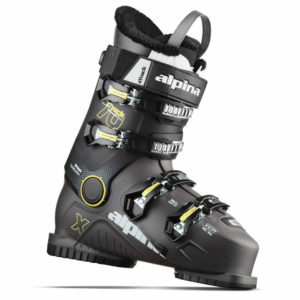 In addition, the Custom 110 features 4 stainless steel inserts to easily accept non-release or any snowboard bindings. “The Summit Custom 110 cm 3D Skiboards are one of our most versatile, high performance skiboards. These are great inbounds as well as in the backcountry. 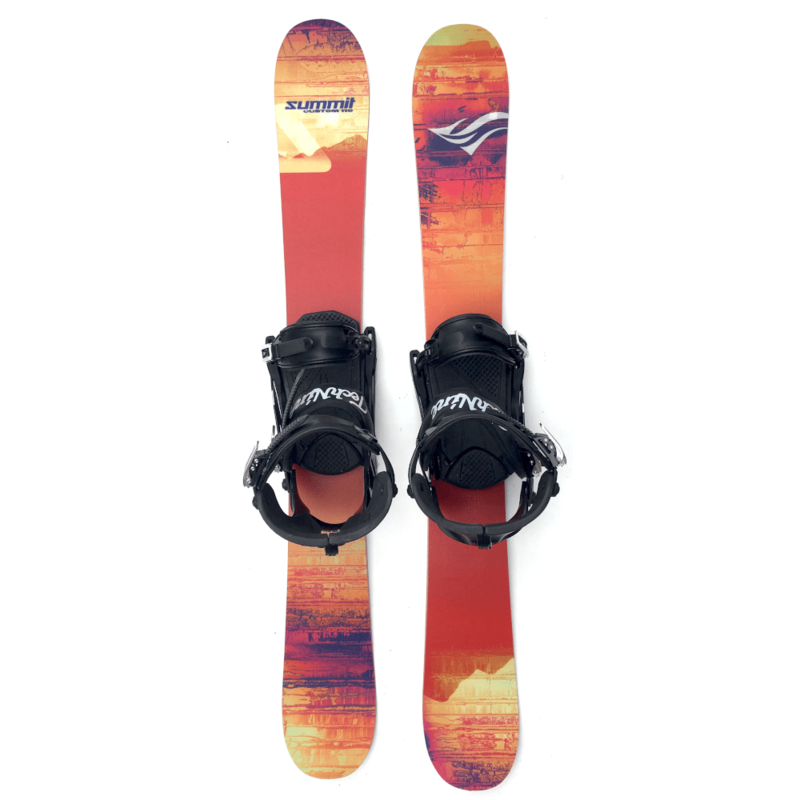 The Custom 110 is a true all mountain skiboard, comfortable anywhere and in any conditions. These carbonium topped skiboards are beautiful too”. Doc Roberts, President, Summit Skiboards, Inc. Recommended for: advanced to expert riders who seek more maneuverability, stability at speed and all mountain freestyle riding. And for intermediate riders who are ready to take a quantum leap in their riding ability. Base color may vary between dark blue/white and white/dark blue. Tuning: We recommend getting your bases hot waxed before riding. You can choose our Add a Hot Wax Service and receive your skiboards waxed and ready to ride. You can use our Quick Mini Tune Kit to maintain your skiboards in optimal condition. More about skiboard bindings and advantages of each. ABS Sidewall Construction: sidewall construction offers many advantages over cap construction. Among these advantages are increased torsional stability, greater edge protection, enhanced power transfer to the edges, improved vibration dampening, greater strength and a full length flex from tip to tail. Translated, these will ride like no other skiboards you have ridden. Traditional Camber: Camber produces a stable and smooth carving edge that you can trust when you need it the most. 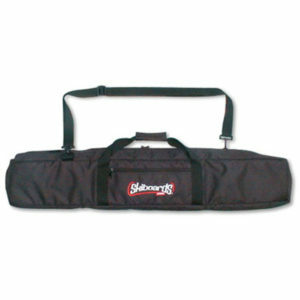 Provides exceptional edge grip. Wood core: vertically laminated, hand selected cold temperature birch wood core runs the full length of the skiboards, tip to tail. This provides a lighter weight, yet superior strength. The benefit of Northern Hemisphere Birch is that the colder temperatures cause the trees to grow at a slower pace, thus creating a denser, yet lighter wood. As a result, the birch wood core is very light, yet super strong and durable. Cores are vertically laminated for extra strength.The high energy, lively wood core is sandwiched between two top layers of triaxial fiberglass (new layer added this season) for torsional strength and a layer of triaxial fiberglass underneath. An additional layer of Kevlar is is added for not only extra strength and impact resistance, but super long durability that maintains the energetic pop in the skiboards.These skiboards offer just the right combination of flex and torsional stiffness providing a super smooth ride without the chatter no matter how much you lay it over. In addition, a rubber dampening layer is included to absorb vibrations while still allowing maximum road feel. Stainless Steel Inserts: (for non-release bindings) 4 stainless steel inserts are centered within each skiboard, in a standard 40 X 40mm skiboard binding mount pattern. This increases the retention strength of the non-release bindings and allows for quick and accurate mounting, making it easy to interchange with other 4 hole pattern bindings. These will fit standard non-release skiboard bindings like the Bomber Elite or Snowboard bindings like the Technine Custom Pro Snowboard bindings for skiboards. Aluminum reinforcement layer: provides extra retention for release bindings, yet not adding weight and does not inhibit flex in any way. Also adds to enhanced edge grip. 3D Carbonium Top Sheet: rare, super strong top sheet that allows the full graphics to show through without distortion, yet offers extra protection for the top sheet from dings and nicks. Adds additional torsional stability for riding hard and enhanced edging. Beveled Sidewalls: angled to further protect the top sheet. Die Cut Sintered bases: these are made of one of the best base materials – 4000 p-tex sintered – for greater durability, maximum wax absorption and speed. These bases have less friction and thus more speed as well as less vulnerability to abrasion and impacts. These are highly durable bases that allow for maximum wax absorption to ensure a smooth glide, while offering the ability to attain speeds that are truly impressive. Edge bevel: 1 degree base and side bevel of 89 degrees – great for carving with ease. These aggressive edges are just right for ice, and lay it over carving.